Welcome, prospective student! Here you’ll find resources and information about the Department of Physics & Astronomy, scholarships and financial aid, and about the careers your degree and skills could help you achieve. Physics is the most fundamental of all the sciences, the study of matter and energy and their interactions. It provides the underlying framework for chemistry, biology and beyond. Physics is not just a body of knowledge — it is a set of approaches that allows people to solve all kinds of problems. Physics seeks to describe the most basic features of a system and the underlying general rules that govern them. These rules are powerful tools for understanding that system and similar ones that physicists may encounter later. Finally, physics is ultimately an experimental science, grounded in the truth of the phenomena that are observed in the real world. Theories are tested by experiments and then repeatedly refined to give the best description of the observed data. Designing experiments to give the most accurate and useful information is itself an art form. Because the study of physics develops such strong analytical skills, physicists go into a wide variety of careers such as engineering, law, medicine, computer science and information technology, optical and laser science, and materials science. Many physicists work in government or industrial laboratories, but some start their own businesses. Some complete master's or doctoral degrees after their bachelor's, but others start their careers right after college. Physics is fun! Physicists learn how the world works with experimentation and observation. Physics is challenging! Physicists don't just describe the world, they figure out the how and why that's underneath. Physics makes you a better thinker! It will help you develop analytic and quantitative skills, tools that will prepare you for success in a wide range of careers, solving problems that have never been encountered before. Physics leads to technology! Many innovations we take for granted in our daily lives (like our smartphones) were developed out of research in physics. 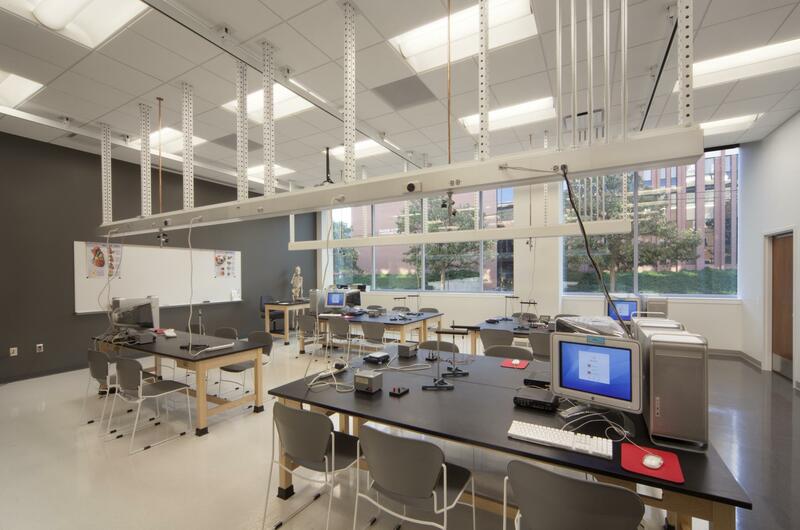 Student laboratories are fully equipped to allow students to put into action lessons from their lecture courses.